Arisa: a world of loss and hardship; of legend and wonder; the world of A Warrior’s Path. 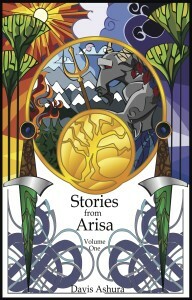 Return there now with Stories from Arisa, a short story collection featuring four wonderful new fables from that mythic place; each one a polished gem; together, an assemblage spanning the realms of hope, humor, tragedy, loss, and love. The Baels of the Eastern Plague have fallen away from Hume’s teachings. It is Li-Dirge who finds leadership thrust upon him. He must challenge the SarpanKum and return his brothers to the path of fraternity. The House of Fire and Mirrors. The Fort and the Sword. Both are Kumma military academies and fierce rivals in the city of Ashoka. The Wrath is the annual competition between the two schools, deciding bragging rights for the next year, but it is the Prank that dictates who laughs last and longest. This year, it is especially important for Rukh, Keemo, Farn, and Jaresh. Drin Port only wanted a long, tall drink. Many long, tall drinks. When chance brings him the opportunity of a lifetime, will he have the wisdom to take advantage of it? Also included are the prologue and chapter 1 of A Warrior’s Knowledge, Volume Two of The Castes and the OutCastes. Great book 1. I’m really looking forward to the upcoming books. It’s great to an author in “Sci-fi fantasy” genre not setting the story in the same ol’ medieval European Lord of the Rings-like back drop. This is a breath of fresh air. Thanks for the kind words, George, and I’m thrilled that you’ve liked the story so far! I’m glad you’re loving it so much, and I’d love to hear your thoughts when you finish the series. BTW I left a little hint at the end about how Rukh and Jessira reach our own world, which is where The Chronicles of William Wilde takes place.